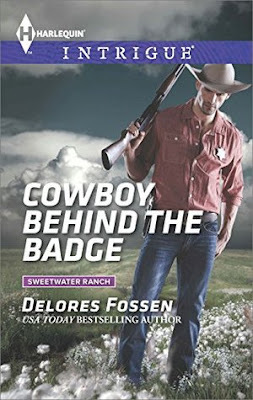 Cowboy Behind the Badge by Delores Fossen is the second book in the Sweetwater Ranch series and having already enjoyed reading the first book, Maverick Sheriff, I was eager to start on this one. Another lovely and thrilling romantic suspense from Delores Fossen, this book narrates the story of Texas Ranger Tucker McKinnon and Laine Braddock whom we met in the first book and know that they were once lovers and now separated because of the enmity between their families. But when danger brings Laine to Tucker's door, he is determined to save her. While this book is a separate story but still there is a background story of Laine's father's murder and the prime suspect is Tucker's mother who had an affair with him at the time of the murder. So I would recommend reading the books in order. The story is fast paced and full of action, thrill, suspense and a passionate romance between two headstrong characters. The characterization is admirably done and after the first book, I already felt closer to the Braddock and McKinnon family who due to their parent's mistake is now at loggerheads despite having been friends once. Tucker and Laine had me wishing that they solved their problems and came together like they were meant to be. The danger part is beautifully developed by the author and she had me at the edge of my seat, speculating the next twist right till the end. All in all, Cowboy Behind the Badge by Delores Fossen is an entertainer and I enjoyed reading it. 4 out of 5 to it and recommended to all romantic suspense lovers. I am now eager to read the other books in this series.